Cassiopeia and Ursa Major make their slow, daily rotation around the hulking 6,611 meter shoulder of the Nanda Devi satellite peak, Nanda Khat (the bed of Nanda Devi). The squeak of styrofoam snow on hard plastic boots and the cold metal of ice axes is all that is heard at this, still, early hour of the day. A long line of headlamps glow into the distance but the ground at my feet is dark. Faint shadows of grey, grayer, black and blacker are the only indications of the kicked steps that stretch out before me. I move slowly, patiently and evenly. My breathes come easy and regular despite the elevation and the shouldered load. The too early of a start has not allowed for the freeze to happen yet and each step off of the beaten track results in a calf deep posthole. The freeze will come at the three or four o’clock hour, still almost 90 minutes away. Yesterday we had set a track from our camp near Baba Ji’s house which was all but undetectable to those not versed in reading the braille of small snow bumps in the snow covered valley. We had started at a reasonable hour, a respectable 0800 but the deep sub-freezing temperatures of the night prior granted the fifteen of us ease of passage across the frozen surface. 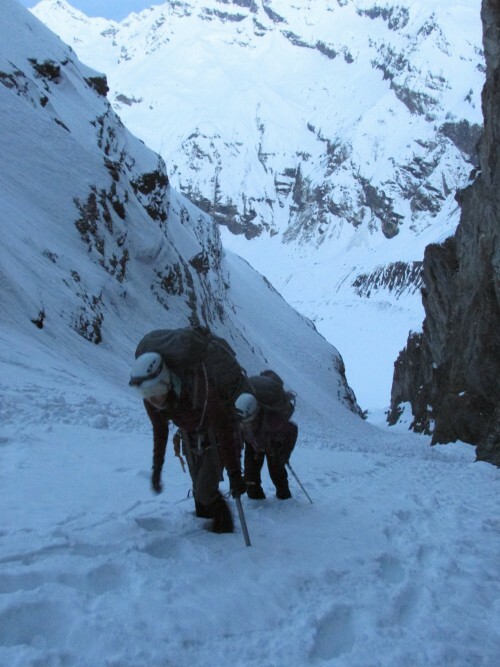 We wandered to the base of our approach gully till the quickly softening snow slowed us with the inevitable post-holing.. We broke for water, food and rest. Our goal had been to break trail back, acclimate and scout. Jesse, Bharat, three students and I continued post-holing upward for advanced scouting, while Madhu and the rest of the group turned around and headed back to camp. We breached the lower half of the gully with a step kicking reconnaissance. Falling debris that came with the warmth of the mid morning sun finally signaled us to turn around. The long glissades down cut our ascent time by two thirds. Back in camp Madhu was sorting the loads. All of our food, gear and fuel for the next 25 days had to be carried up. We made a plan and as a light snow began to fall, I settled into an unsleeping rest. Now, high in the steep walled gully a slight breeze redistributes the previous evening’s snow. The moonlight and glow of headlamps fade into to the predawn light. Above me, Madhu and Bharat kick steps, wallow and struggle upward. Around me novice students fight their own battles against cold, fatigue, gravity and self-doubt. And somewhere behind us, to the north, Nanda Devi, the patron-goddess of the Uttarakhand Himalaya, sits watching it all with a unblinking, steadfast, indifference.